Hannah Clark is hosting a fun Ways to Use It Challenge over on SCS - use something old (older than 6 months) and use something new. For something old, I went back to my very first BasicGrey purchase and that was the Sultry pad put out in 2008. It's still a fave of mine! 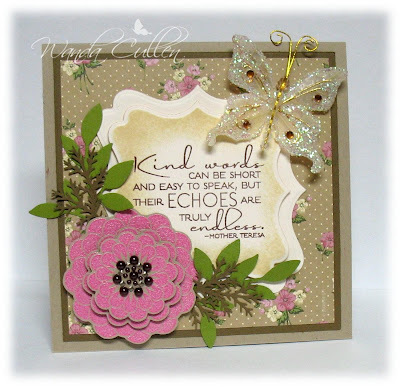 The "new" is the Die-namics rolled daisy die that came in the mail yesterday and a new sentiment from Verve. I need to practice a bit more, but decided this was an OK version for my first try. 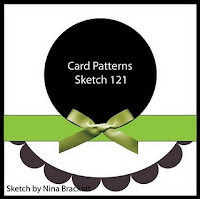 The layout is using Card Patterns Sketch #121. 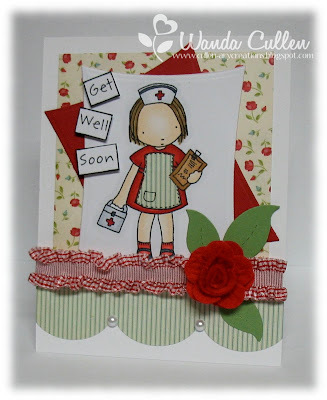 Another quick card and a quick post...off to get ready for work! 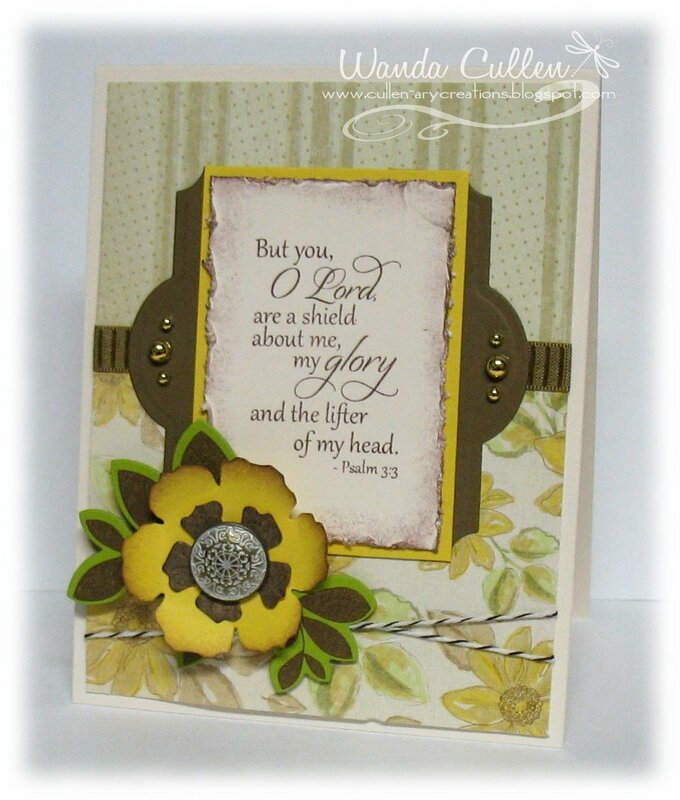 ACCESSORIES: MS doily tag, Foliage die (Spellbinders), Die-namics rolled daisy, Pearl, Lacey circles Nestie. 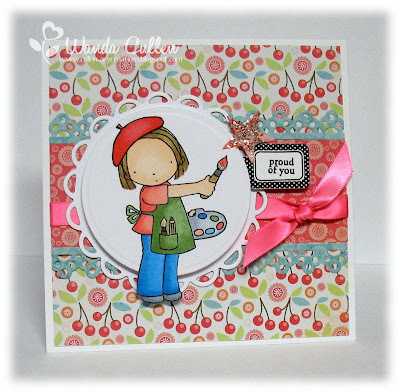 This card uses the colors for the Color Throwdown Challenge: Cameo Coral, Pacific Point & Garden Green and the sketch for the MFT Wednesday Sketch Challenge in the MFT forum. I colored with Copics and added glass glitter to the punched star. 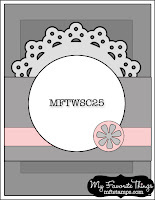 ACCESSORIES: Doily lace border Die-namic, Tiny tag die (PTI), Satin ribbon, Circle & Lacey circle Nesties, Copics, Glass glitter. It's been determined that the teapotters can't count, so mudder is asking us to use numbers on our card so we can practice. Mrs. Estelle T. Stump, the grumpy schoolmarm, must have passed me on this card - you can see she gave me a star! :-) This will be sent to a secret destination...wonder who will get "tickled" to get this card... For more details to the story, please visit the Teapot Tuesday challenge on SCS. 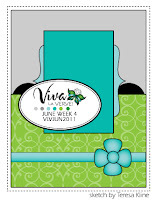 ACCESSORIES: Twill tape & button to create flower, Foliage die by Spellbinders, Satin ribbon, Labels Twenty One Nesties. 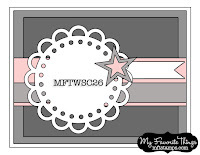 Splitcoaststampers' Color Challenge - Joanne has chosen a great combo using Soft Suede, Melon Mambo, & Crumb Cake with neutrals of white or vanilla. Dessert option - butterflies. Mojo Monday Sketch Challenge - this week it's a round or square version. I immediately thought of this DP from SU's Springtime Vintage collection. Three different sizes of the flower were stamped with Versamark ink then embossed with Melon Mambo EP, cut out & popped with dimensionals. What else did I use? 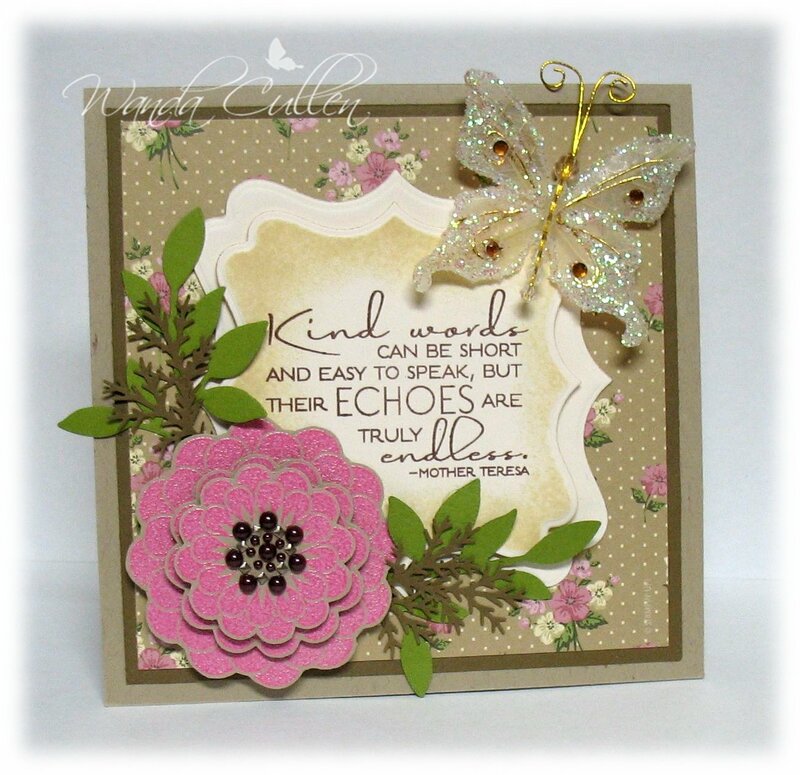 STAMPS: Kind Words (Verve) - sentiment; Dream Big (Verve) - flower. 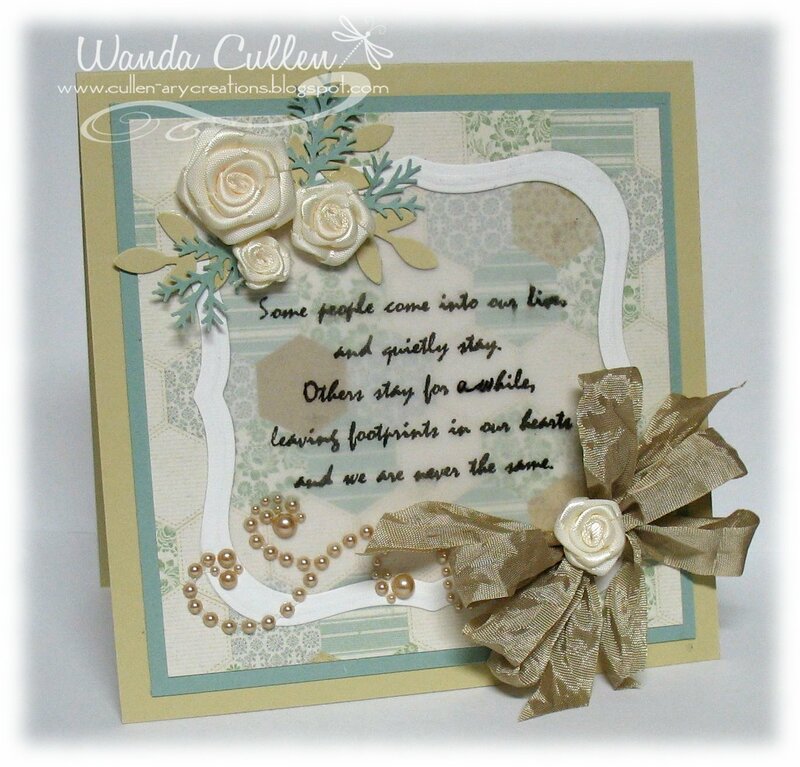 PAPER: Springtime Vintage DP (SU), Crumb Cake, Soft Suede, Vintage Cream, Old Olive. INK: Versamark, Chocolate Chip, Antique Linen distess ink by Tim Holtz (sponging). ACCESSORIES: Little leaves Sizzlets by SU, Fern punch by MS, Labels Sixteen Nesties, Adhesive gemstones by Prima Marketing, Natural skeleton leaf butterfly by Recollections (Mike's). 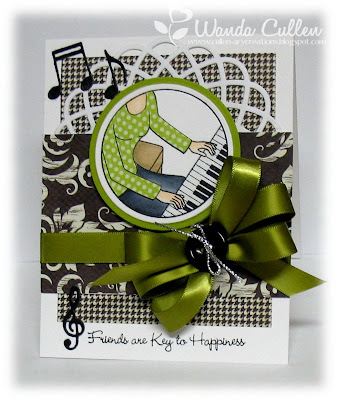 ACCESSORIES: Tiny Tags die (PTI), Satin ribbon, Paisley EF, Fanciful Flourish die by Cheery Lynn Designs. Hard to believe we're in the 4th week of June already...we'll be Christmas shopping before we know it - lol! 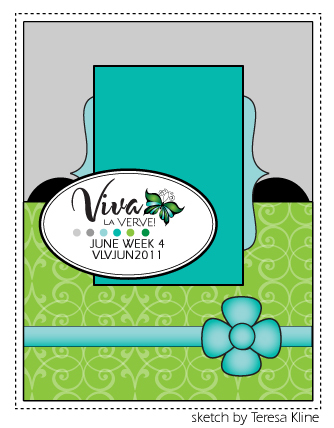 This card was made using Teresa's great sketch for the Viva la Verve challenge in the Verve forum. I haven't used yellow in quite awhile and was drawn to this beautiful paper in the Julianne specialty paper pack by K&Co. The Soft Suede decorative edge is just a Labels Twenty One Nestie cut in half. 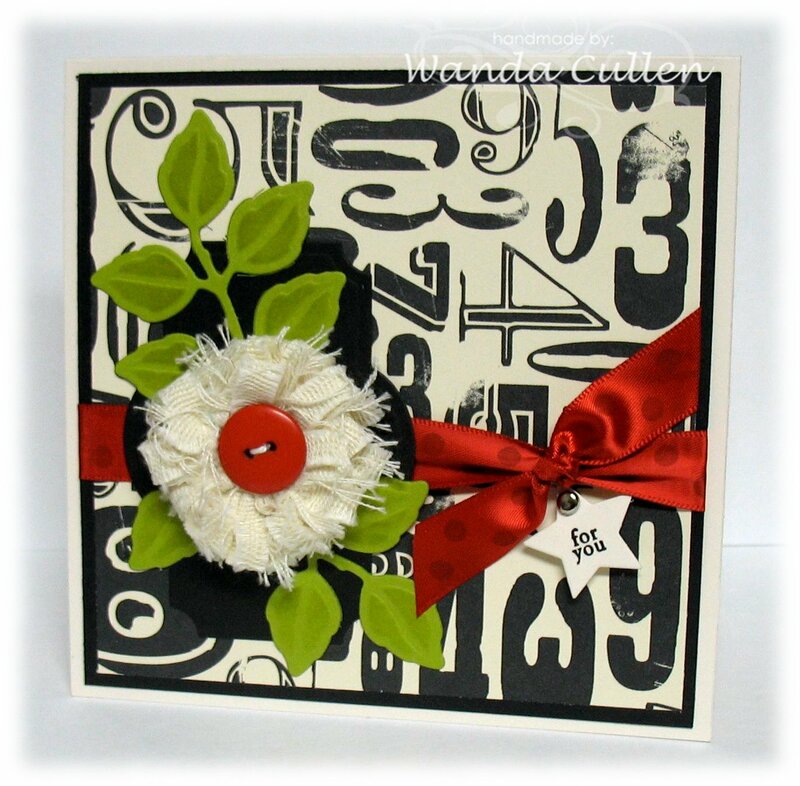 The flower is a Tim Holtz die (Tattered Florals) and the leaves were from my leftover stash. This was a quick, simple card to assemble. 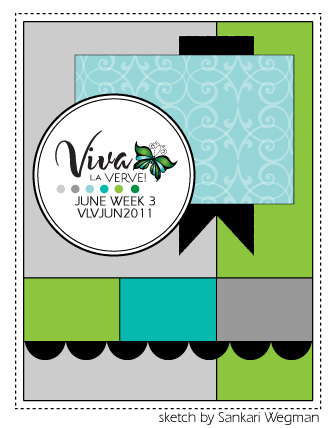 Have been working on next month's Dirty Dozen projects...I'm loving this theme as much as the text theme for June. With vacation coming up soon, I need to think ahead...no procrastination which is usually my norm! We're not getting any rain, so I'm headed out the door to do some watering! Hope your Friday has been good. This week is flying by...hump day already! 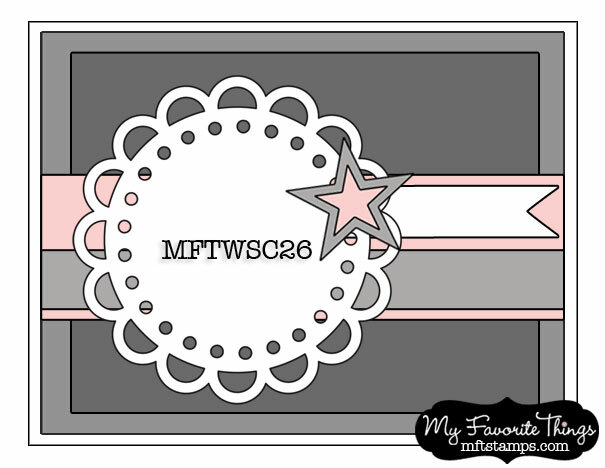 I always like to play along with the MFT gals in the SCS forum for the MFT Wednesday Sketch Challenge...they are quite the talented group of ladies! When I saw the circle element, I knew I wanted to use this piano image. I love the black and white with a pop of chartreuse (PTI's version of Kiwi Kiss that SU retired...sad to say!). I paper-pieced the blouse and colored the rest with Copics. 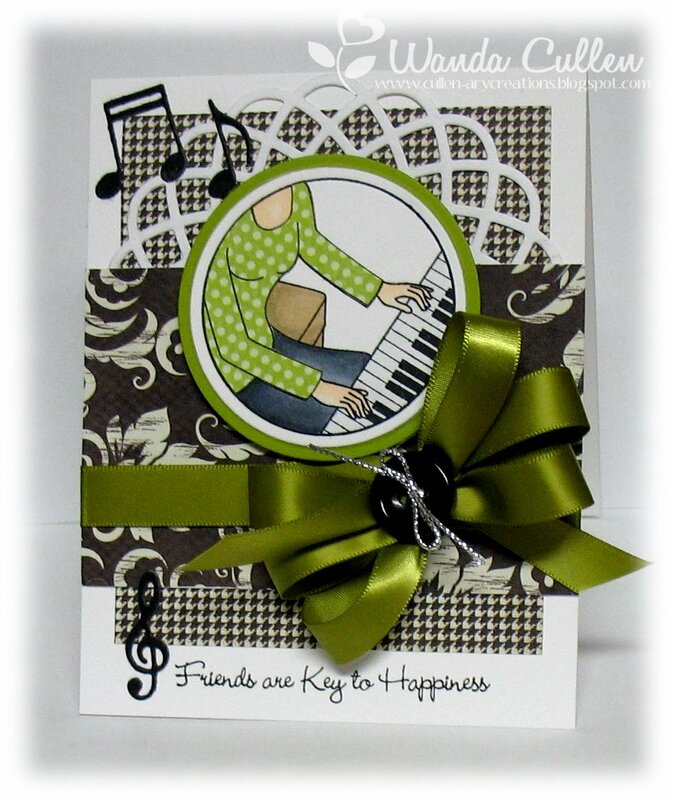 The notes and treble clef sign are tiny dies by MFT. 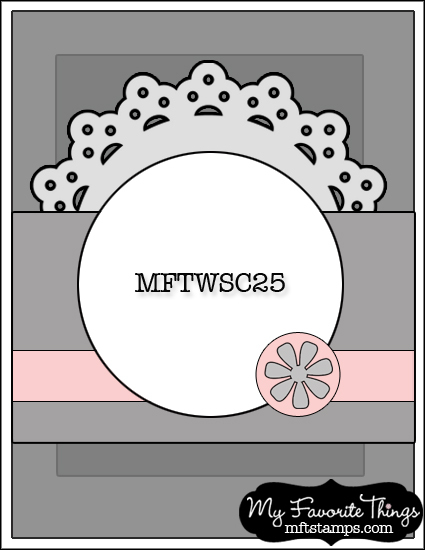 The doily circle is also a Die-namic from MFT. ACCESSORIES: Circle Nesties, Simply Chartreuse satin ribbon by PTI, Button, Silver ribbon wire, Music and Doily Die-namics (MFT). Betty has some fabulous colors for the SCS Color Challenge this week: Cherry Cobbler, Night of Navy & Crumb Cake with the dessert option to use something from the kitchen - a piece of burlap in this case. I'm also entering this into the Crazy 4 Challenges blog to use twine or string. I used both baker's twine and some jute twine. I love this new SU set from the summer mini - perfect for masculine cards. I'm needing quite a few masculine birthday cards, so this will fit the bill for them. 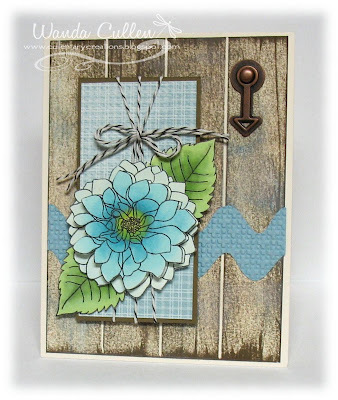 Lots of distressing and sponging with tea dye distress ink...a crimped frame and a collage tag (cut with a Verve die), and a sailor's knot finish this off. 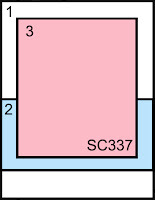 The cherry cobbler base panel was dry embossed using a diamond EF. ACCESSORIES: Burlap, Sponge, Distressing tool, Tag die by Verve, Diamond EF, Baker's twine, jute twine, shell charm. 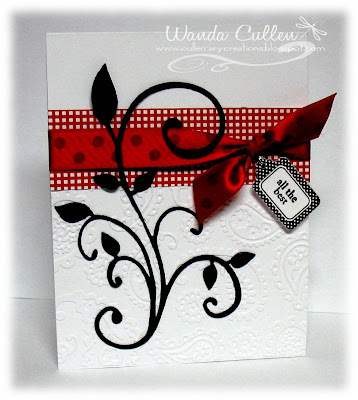 I combined two challenges for this card - the Mojo Monday sketch challenge and the SCS CAS challenge to create a tall & thin card. 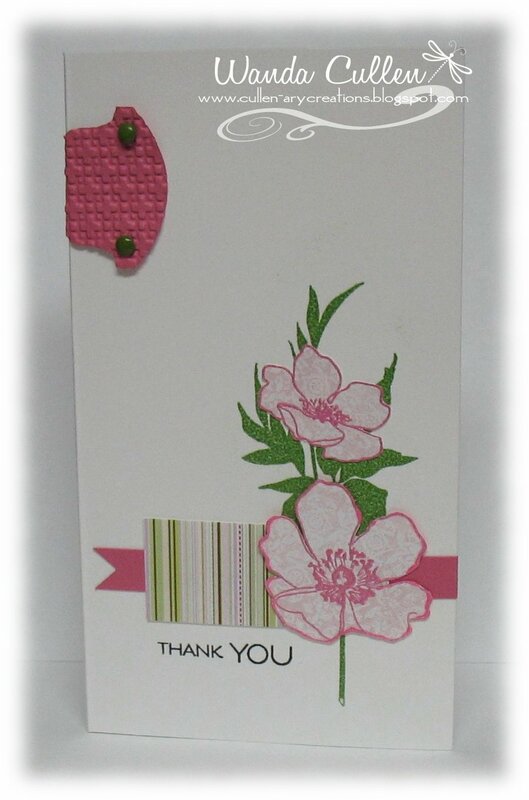 Flowers were embossed using Melon Mambo EP; leaves were embossed using Wild Wasabi EP. I seldom do a one layer card, but ended up liking this one afterall! Hope you're having a fabulous Monday! 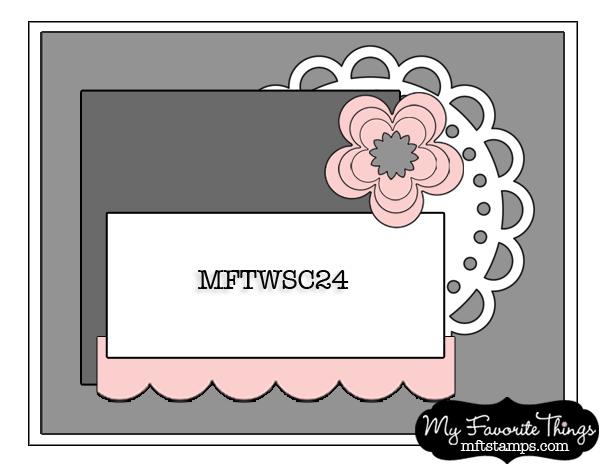 ACCESSORIES: Wild Wasabi & Melon Mambo EP, Square lattice EF, Round tab punch (SU), Brads. The Free 4 All challenge on SCS was to CASE a cyber friend. I went to my Favorites and was drawn to a one layer card that my DD sister, Bridget, created. Simple but so striking as you can see below! 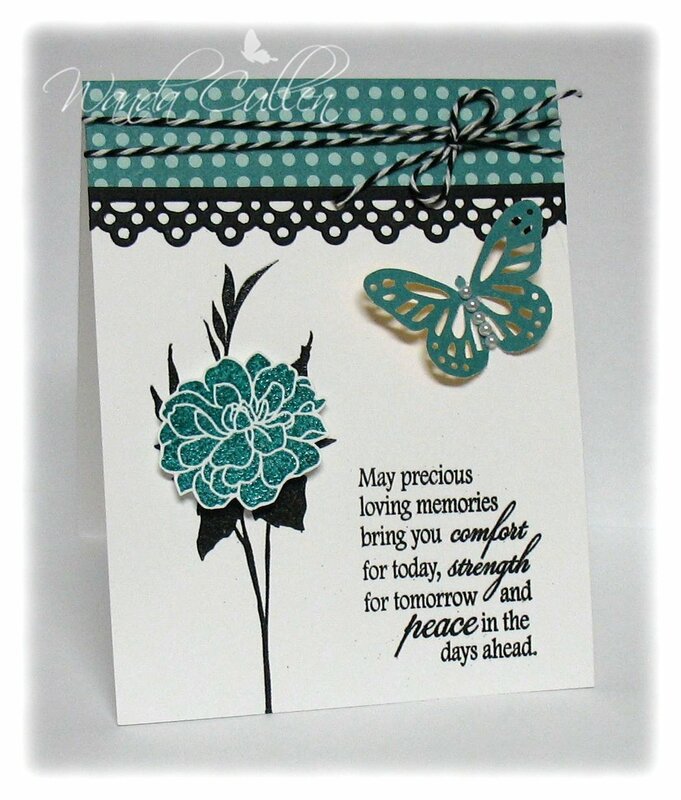 I went with a different silhouette image, different sentiment & made an A2 sized card instead of a square. 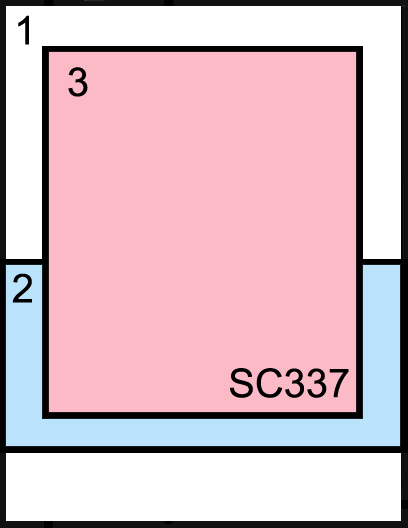 I kept the colors and the basic layout the same. The leafy image was embossed with black EP and the flower was stamped in Bermuda Bay ink then clear embossed, cut out and popped with foam dots. The sentiment was also embossed in black. 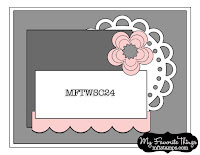 ACCESSORIES: Baker's twine, Doily lace Die-namic by MFT, Butterfly punch by MS, Black EP, Clear EP. 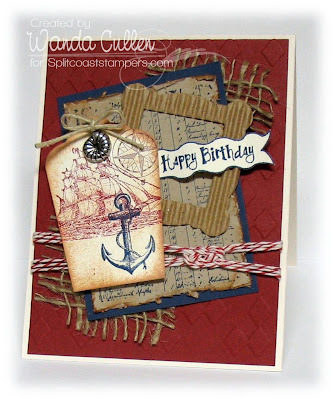 ACCESSORIES: Corner scallop punch, Crimper, Paper piercing tool/template, Circle Nesties, Baker's twine, Anchor charm, Open scallop & wave Die-namics by MFT. For the Ways to Use It Challenge on SCS, Toni has asked us to use vellum. I love the soft look of vellum, but DON'T like the way ink smears easily (wonder how I know?)! Thankfully, an eraser took care of the smearing. 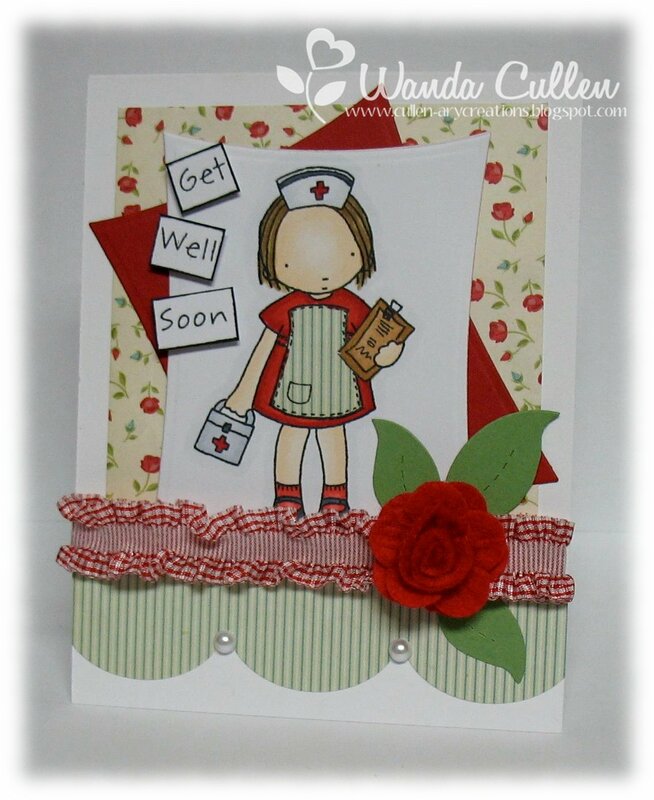 :-) I needed a card for our nurse manager who is retiring end of the month. She's an avid quilter, so knew I wanted to use this gorgeous DP by DCWV. I dug into my CS archives for some Sage Shadow - a really old retired SU color - which matched the print well. Several gallery entries used a frame to adhere the vellum to the base, so I tried it and LOVED the idea! Have to run...time to go to work. ACCESSORIES: Labels One Nesties, Ribbon roses by SU, MS fern and frond punches, MS seam binding, Adhesive pearls by Recollections (Mike's). My son loves to bike for transportation and loves the big city life, so he can use this...along with the metro and his feet...as his way to get around. I needed a birthday card for him (he's my oldest and turns 28 on Saturday), so Korin's layout for the SCS Sketch Challenge was perfect to create this little summer scene. The clouds are die cut from felt. 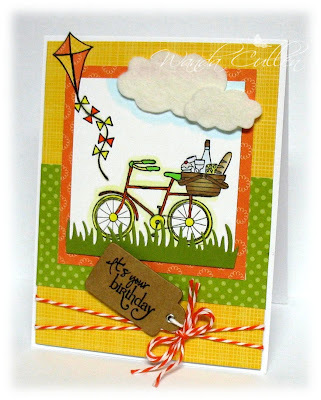 This is also for Crazy 4 Challenges to make a masculine card and for the Color Throwdown Challenge to use daffodil, tangerine and kiwi colors and for the CCEE challenge to include a kite on a card. 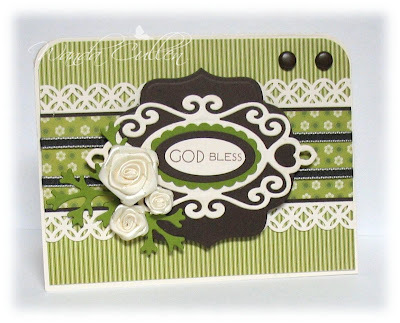 ACCESSORIES: Cloud & grass border Die-Namics by MFT, Maya Road kraft mini tag, Baker's twine, Copics, felt. 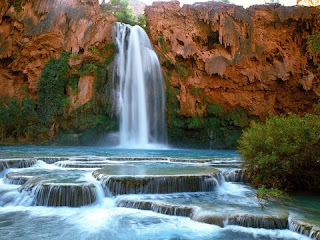 It's time again for another wonderful photo inspiration challenge over on the For Your Inspiration blog where Steph has a gorgeous waterfall scene to stir your creativity! I loved the earthy colors of browns, blues and a touch of green, so went with that color palette. In addition, I thought the rough, jagged surface of the mountainous rock could be represented by creating a rustic, wood grain BG using the direct to paper technique. I scored 1" lines then swiped Soft Suede ink across the vanilla paper. I smudged some white pigment ink then swiped a hint of Aegean Blue chalk ink on the paper. 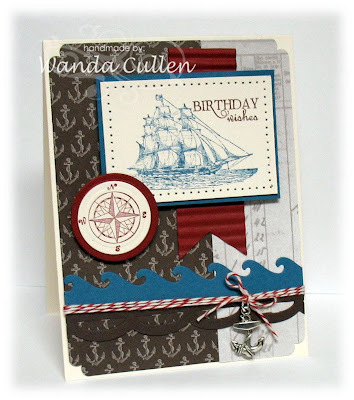 For a tutorial of this technique, check out Lydia's video in the Splitcoast resources section HERE. I used rickrack to represent the wavy flow of the water over the rocks. I love using my new arrow brads from my shopping trip last week and balanced out the card with a copper brad. The flower was colored with Copics (BGooo, BG53, BG72, Y13, G40, G82, G85). I'll wait to add a sentiment on the inside as the occasion arises. What else did I use? ACCESSORIES: Rickrack Die-namic (MFT), Lattice square EF, Chocolate baker's twine, Arrow brad by Paper Studio, Copics. I still can't believe it!! Me? A member of the Dirty Dozen design team on SCS? It's been REALLY hard not to shout it from the rooftops since I got the message to return a call to Lydia on May 19! It's such an honor, yet a bit intimidating to be surrounded by so many ultra talented designers! Let me just say that EVERYONE on that team has been so kind and welcoming...true friends in every way! It's been fun chatting with them in the secret forum...we laugh a LOT! :-) Excuse me while I hop from one cloud to the next! :-) The real world is telling me I have to come down out of the clouds and go to work this afternoon! Bah humbug! This week started off great with my fave Nascar driver winning the race at Pocono (yay, Jeff!) then the Mavericks beat the Heat in Miami...life was good but even better with today's DD reveal! Hope your week is going well...hugs to you all! This week, the teapotters can bring horses, bicycles, or nurses...AND we HAVE to bring flowers. The destination is Jessica in Orangeville, CA, daughter of Mutnik (Cathy), one of the regular partiers. Jessica had an unfortunate accident where she was thrown from a horse and her 2 "good Samaritans" were a nurse and a bicyclist. For more of Mothermark's story...please check out the thread HERE. I decided to bring Florence to care for Jessica, so her stay in the "horsepital" would be short-lived! :-) Florence was colored with Copics and her apron was paper-pieced. I couldn't fit the sentiment as a single line, so cut up the words and staggered them to fit. TFL! ACCESSORIES: Large scallop Die-namic (MFT), Gingham stretch lace, Felt prima, Leaf die by Sizzix, Wonky rectangle Nestie, Copics, Adhesive pearls. 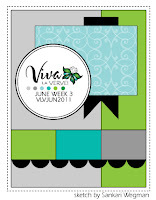 PAPER: Odds & Ends Mini Deck by Cosmo Cricket, Vintage Cream (PTI), Old Olive & Early Espresso by SU. ACCESSORIES: Corner chomper, Labels Nine Nestie, Fancy Labels Two die, Oval scallop, small & large oval punches by SU, Satin rosettes (SU), Foliage dies (Spellbinders), Modern Garland border punch (MS), Brads by Paper Studio. Steph has another fun website, Dali Decals, for the Inspiration Challenge on SCS! 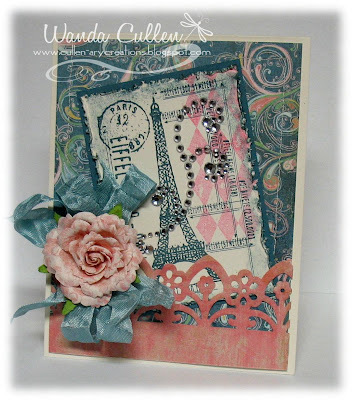 I chose the Eiffel Tower decal and stamped this Tim Holtz image in Blue Bayou on Vintage Cream CS. The diamond argyle stamp was done with Cameo Coral ink. The edges were distressed and sponged and layered on Blue Bayou CS. Some bling, a Prima, crinkled Baja Breeze seam binding and a Garden Gate deep punch border finish off this card. Paper is from the Two Scoops pad by BasicGrey. 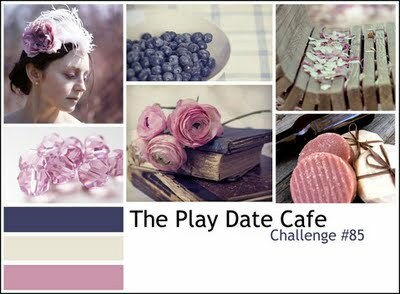 I used the beautiful colors for the Play Date Cafe Challenge to use blueberry, cream & dusty rose.